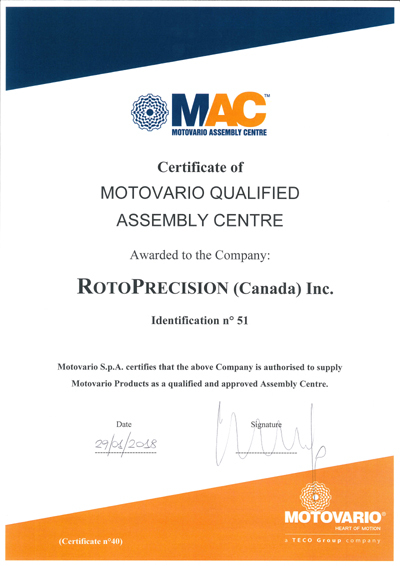 RotoPrecision is pleased to announce it has achieved MAC Approval and is now a fully authorized Motovario Assembly Center in Canada. “The combination of RotoPrecision’s industry-leading customer service and Motovario’s broad range of world-class power transmission products including Helical, Helical-Bevel, Worm and Shaft-Mount Reducers, as well as Mechanical Variators and Electric Motors, will set the stage for a greatly enhanced customer experience across the country,” he continued. 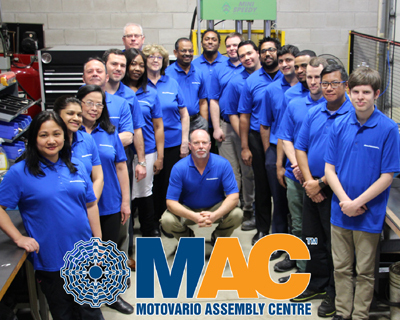 RotoPrecision’s MAC center is located in Mississauga, Ontario and is supported by regional sales offices and additional stocking warehouses in Montreal and Vancouver. 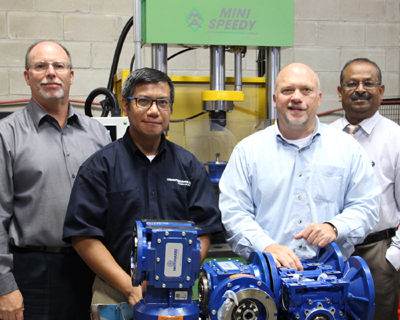 Left-to-Right: Gregg Robinson, President, RotoPrecision Inc.
Samuel Rabanillo, Operations Manager, RotoPrecision Inc.
Mark Cousson, Quality and Customer Service Manager, Motovario Corp.
Mohammed Najeebuddin, Application Support Manager, RotoPrecision Inc.